Does anyone know a generalized Custom Number Format I can apply in Google Sheets such that numbers appear with it's scale operator and rounded to one decimal place? 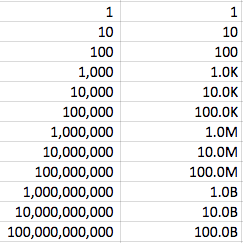 I looked up a good answer below but I'm not sure how to edit the formula for billions, trillions, and so on. Why doesn't “Custom number format” show up in Google Sheets (Google Spreadsheets)?